Treat yourself and your family with this sweet home made Choco Strawberry cake during Christmas or any other festive occasion whether birthday or anniversary or others. This quick and easy to make home baked chocolate cake would loved by everyone. 1. Put, sugar, vanilla extract and chocolate in a large saucepan. Heat gently and stir continuously until everything melted together. Remove from heat and stir it again and again. 2. Preheat the oven on 180 degree C for 5 mins. Simultaneously line a deep baking tin, 20 com round or 18 cm square with double layer of baking parchment. Also, use butter properly on the side of the tin. 3. Mix flour, baking powder and salt properly. Now in the chocolate mixture saucepan, stir the eggs and beat it constantly. 4. Now, add the flour mixture on the liquid chocolate mixture and stir again and again so that any lumps don't form. It is better if you use the electric beater to beat everything properly. 5. Now Scrape into your prepared cake tin and bake it for 1 ½ hours or until skewer poked in comes out clean. Cool the tin and remove the cake from the tin and place it nicely on a plate for decoration. 1. Take a bowl and add chocolate cream and whisk it properly. You can also take white cream and add few drops of liquid chocolate to form the chocolate colour cream. 2. Now gently spread the cream evenly on the top and side of the cake. Decorate the top side of the cake with gems and strawberry pieces on the side. 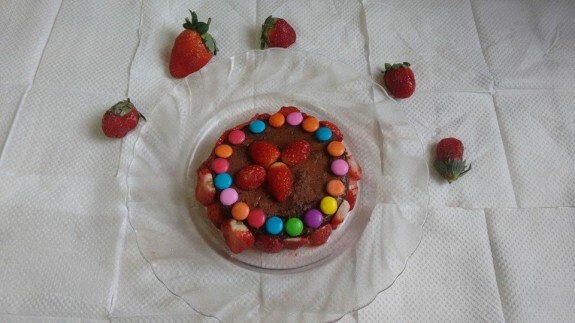 In the middle decorate with strawberry to make a flower. Note: This is a simple decoration idea. You can use any creativity to decorate your cake.